I am reading and trying to learn teh S&S system and had a quick question. Why no love for the spear? it seems to be a very weak weapon of choice. Some DMs activate a veritable Rube Goldberg machine of rules pertaining to range, hallway width, haft weight, whether or not the character is mounted, etc. that's supposed to compensate (in certain very specific combat situations and if anyone actually remembers) for the spear's low damage. I tend instead to bump up the spear's damage to compete with other two-handed weapons and call it good. Never underestimate the uses of a spear. As zeraser pointed out, hallways are a great example. They can also attack through slits, or cages. Furthermore they function excellently in lieu of 10' poles. I think really, that the real life concept of a spear being a poor man's weapon, carried over to D&D. The true power of the spear lies in player creativity, and it's diversity. The spear as listed in S&S is really a representative of the very primitive spear used by natives in primitive environs, not pole arms. It bears mentioning that if the spear in this form was such a dominant weapon, it wouldn't have been replaced by swords, maces and axes. All that being said, the real reason it is the way it is, is because the weapons in S&S were adapted from certain other historical gaming sources generally discussed on these forums . The Spear in Man-To-Man Combat: Several players have asked why the spear is so (seemingly) ineffective in the CHAINMAIL Man-To-Man combat system. There is no question that the Melee Table shows it as the least effective weapon statistically, although due to its length it usually allows figures armed with spears to deliver the first attack. However, before discussing its seeming ineffectiveness further, I believe a short discussion of the weapon itself is in order. The pike of 15 to 20 in length. The spear was a weapon primarily of barbaric peoples or poor ones. The Vikings of the early Medieval period used it extensively, but it was abandoned for more effective arms whenever possible in most cases. The Scots used it throughout the period, but the Scottish version of the spear was very long indeed, and was more nearly a pike. The various peasant levies used it little by the middle of the period, carrying instead combination-type pole arms, i.e. the halberd which combined axe and spear and similar weapons with which both the thrust and the chop were possible. Those weapons which did not combine those two types of attack were either pike-like or broadly hooked so as to otherwise catch opponents not penetrated by the thrust. AlI of the latter class had hafts longer than that of the typical spear. 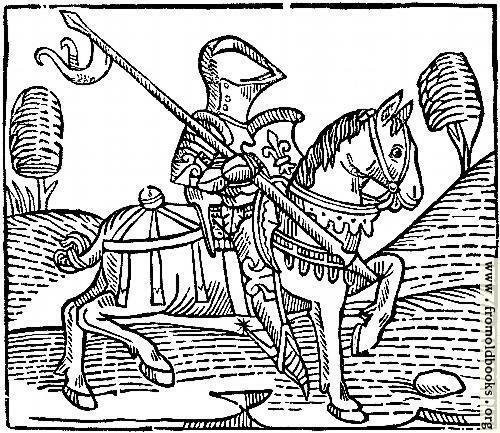 With this in mind, it is easy to note that a spear-armed man is unlikely to be pitted against any armor class greater than chain-type, with or without shield. At first glance this still seems to put the spearman at a serious disadvantage. However, I suggest the following: As the spear was ineffective against better protected fighting men, the proper employment historically should be sought by those fielding such troops. When they are confronted by foot troops in superior armor the spears should be hurled and the figures then considered to have drawn secondary weapons. This is what spear-carrying Vikings did historically, for example. When confronting mounted troops the spearmen are then of utmost importance, for unless the horsemen are all lance-armed the spearmen will I have first attack, and the effectiveness of a spear against even a barded horse is indicated clearly on the Melee Table. As the spear is unlikely to turn up in games beyond the eleventh century or so, I am certain that a re-evaluation of the power of the spear will prove that it isnt so terribly ineffective as it appears at f i r s t .